The Long Prairie Area Chamber of Commerce recently recognized Central Bi-Products and Dan's Prize for their continued support of the Chamber Bucks program and helping stimulate the local economy. The two have combined to purchase $61,000 worth of Chamber Bucks over the last three years. Towns of every size are often looking at ways to stimulate their local economy. One method that is being used in Long Prairie is the “Chamber Bucks” program. The program allows businesses or individuals to purchase the Chamber Bucks from the Long Prairie Area Chamber of Commerce to give out as gifts or as rewards to employees. Chamber Bucks are actual gift checks that are available in any increment to be spent in the local Long Prairie area. The money value on the check is guaranteed by the Chamber, so any businesses may take it providing they have an acceptable check policy. It can also be used in Long Prairie and Browerville. -Money value on check is guaranteed by the Chamber. -One size fits all - recipient can get what he or she wants or needs. -There are many places to use them. There are a few restrictions for the program. Checks cannot be written to yourself or another individual, and the person must use at least 80 percent of the check’s value in the store of their choice. This helps ensure the money is actually being spent locally rather than just being turned into take home cash. Two local businesses have utilized the program as an incentive and reward program. Central-Bi, located on Highway-71 north of Long Prairie, uses it as a reward for their safety program. Every month, they have employees do an observation on another employee and take all of those people at the end of the month and draw out three $50 winners. Employees can also accumulate points for attending safety meetings and filling out “Be Safe” program sheets. When they get to 100 points, they give them $100 in Chamber Bucks. They have purchased $52,500 worth of Chamber Bucks over the last three years. Dan’s Prize uses Chamber Bucks as an option as part of their service program. They have offered clothing or gifts in the past, but they learned some people would rather have money. With rewarding them with Chamber Bucks, it gives employees the option to use that money to support their family or go buy something for themselves. They have spent $8,500 in the past three years. The Long Prairie Chamber of Commerce honored both Central-Bi and Dan’s Prize for their commitment to the program at their annual banquet. ​Welcome New 2019​ Chamber Members ! Thank you, also, to all of you who have renewed your membership! We appreciate you and could not do this without you! NEW- Small Business Consultants Listing! Like to know more about the history of Long Prairie? Click here for photos collected by Jeff Lucas. Click here or the button below to request information about activities/events in our area. Please contact me at (320) 732-2514. I am in and out of the office a lot, so please call before coming or take your chances. CentraCare Health-Long Prairie now offers free rides to the clinic, hospital, nursing home from your Long Prairie home within the city limits. ***Call the Rainbow Rider at 1-800-450-7770 to schedule a ride. It’s best to schedule your ride two days before your visit. Rides must be scheduled by calling dispatch at 800-450-7770 prior to 5:00 p.m. They are open Monday-Friday 10am - 3pm. They have many daily activities. See calendar below. 1,000 Books before Kindergarten starts in Long Prairie! Enjoy a fun program encouraging reading and early literacy skills. Stop by the library to sign up! For ages birth through kindergarten. Sponsored by the Long Prairie Public Library. Long Drive In is OPENING this weekend! *DUMBO* 8:30 The all-new grand live-action adventure expands on the beloved classic story where differences are celebrated, family is cherished and dreams take flight. *HOW TO TRAIN YOUR DRAGON 10:30 Hidden World* A perfect finale for a timeless trilogy. Detective Pikachu * Shazam * Aladdin * Godzilla: King of Monsters * Secret Life Of Pets 2 * Men In Black International * Toy Story 4 * Annabelle Comes Home * Spiderman Far From Home * Lion King * Fast & Furious Hobbs & Shaw * Artemis Fowl * IT Chapter 2 * Spies Like Us * Joker … and Adams Family (animated) for our annual October TRUNK-or-TREAT! It's going to be a truly AWESOME summer! 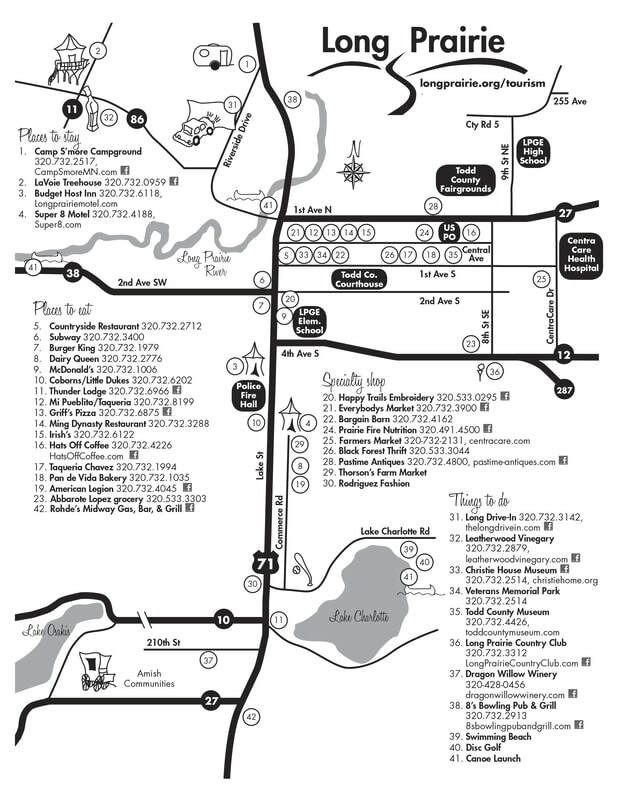 Doug Ohman will take you along to his favorite locations from each of the six “Minnesota Byways” books he has published. He will share the best photographs and stories from around the great state of Minnesota. For school-aged children to adults. These Legacy programs are funded in part or whole with money from Minnesota’s Arts and Cultural Heritage Fund. For the safety and welfare of children age 6 or under, a parent or caregiver must remain in the building during library programs. Practice English in a fun and relaxed way. No English is neces­sary to join! We’ll meet once a month at the library. For teens and adults. This program is funded in part with a grant from the Minnesota Department of Education using federal funding, CFDA 45.310 – Library Services and Technology Act, Grants to States Program (LS-00-18-0024-18). Practicar inglés de una manera di­vertida y relajada. ¡ Ningún inglés es necesario para unirse! Nos encontraremos una vez al mes en la biblioteca. Para adolescentes y adultos. Wednesday April 24th at 10 am. and $15 for 9 holes plus tax, cart included. These rates are valid thru April 28th. 5 pm to 7 p.m.
Volunteer Clean - up & "Opening Party"
- Saturday, April 27th from 10:00 until 2:00. They will meet at the grounds shop adjacent to hole number 1. It would be greatly appreciated if you or anyone else is able to join in the clean up. They can use rakes, four wheelers with trailers and brush cutters. Please let Clif or myself know if you are able to help out. - phone number is 612-770-1653. Join them that SAME DAY for the "Opening Party"!! Happy hour starts at 5. They will have pizza specials and bring your putters!!! Are you a parent/grandparent of a teen? Are you a professional working with teens/ families with teens? This training is for YOU! Learn how to communicate more effectively with the young people in your life! You’ll acquire valuable tools from an expert, Russ Turner, MA, MS, Senior Training Manager at People Incorporated Training Institute, Minneapolis. AND which presentation you’ll attend. Registration is OPEN now, until April 15th. Register soon! May 1st, will be the Men’s Opening Stag night… Grill your own Steak, potato, veg, salad bar will be served starting at 5:00. Cost is $15. Please email Sue Lowe longprairiecc@outlook.com to sign up or sign up on the Bulletin Board in the Pro Shop. Meals will follow for the Wednesday’s for Men’s Day. Taking any requests. Stockholders meeting is Friday May 2. Dinner served by A Simple Dish. She will be serving Boneless Pork loin Chop with gravy, Duchess Potato, Broccoli and Cauliflower Gratin, House Side salad, and Dinner Roll. Cost is $13.50. Please email me to sign up or sign up on the Bulletin Board in the Pro Shop. She is only taking orders until 4/26 by noon. A Simply Dish is Sandi Hanson’s Catering service. During a 20-week ultrasound, Scott and Emily were given a fatal diagnosis for their first child, a son, and asked to abort their baby. Come hear their story of faith and life. Disc Golf Tournament at Lake Charlotte Park in Long Prairie, MN. Along with the opportunity to spend a day with other disc golf players on a beautiful course, players will receive a player pack and prizes will be awarded to the top players in each category. Enjoy the weekend in Long Prairie—disc golf, swimming beach, drive–in theater, and camping. ​A portion of the $30 entry fee is going to the maintenance of the disc course. Please click the link above to download our Sign Use Policy and Fee Schedule. If you would like to use the sign (either as a Chamber Member or as a non-member) please fill out the last page of the form and enclose any payment (non-member) for use of the sign and return to the Chamber office. Thank you. Want More Information on Community Gardens? Call City Hall 320 732-2167 Follow this link for photos and more information about the Community Gardens. 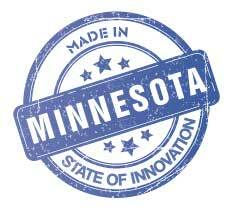 Click on the Made in Minnesota photo to learn more about products and suppliers who are right here in Minnesota!